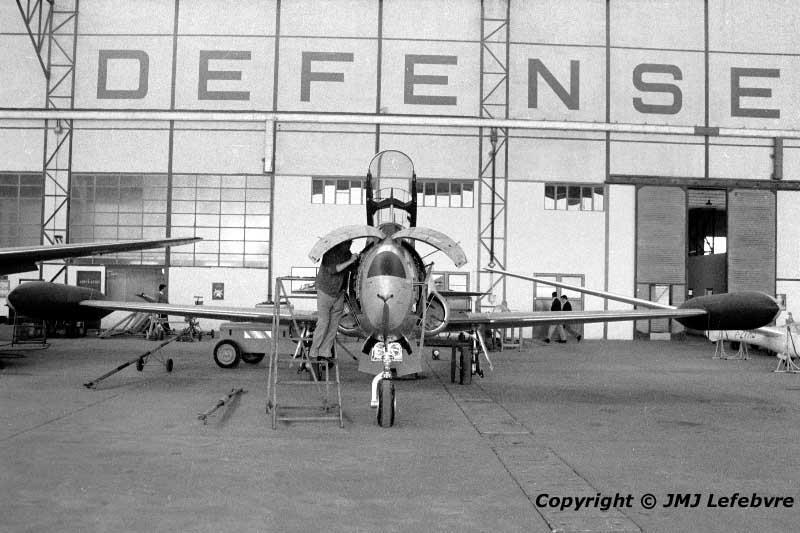 Front view of one of the CEV/EPNER T-33s destined to flight tests in France. The French State test pilots liked the comfortable flying jet platforms as T-birds, Gloster Meteors, Canberras, SNCASO Vautours and other to test the multiplicity of technical systems or armament novelties coming from the French Aerospace Industry. Since the end of WWII, the test activities in France were considerable due to a quite consequent protototypes' policy, first to fill the technical gap born from war paralisy, next to reequip Armée de l'Air with national built top performances combat aircraft, Dassault in less than ten years becoming the uncontested leader with the Mirage over other private companies and the several state owned which also did considerable efforts to open new ways with some original and spectacular design as the Leduc, Durandal, Trident and Griffon prototypes among others.